Table Size: 15 x 12"
MBM's Triumph Kutrimmer 1134 Paper Cutter is a heavy duty table top paper trimmer that has a 25 sheet capacity and a 13 3/4" cutting length. The overall table size for the 1134 is 15" x 12". The Triumph Kutrimmer 1134 has an independent manual clamp, lockable back gauge, precision side guides, all metal construction and a clear safety guard to protect the operator by covering the blade in any position. Manufactured in Germany by MBM's parent company, IDEAL, Triumph Kutrimmer paper trimmers are built to the same exacting tolerances as Triumph cutters. All Triumph Kutrimmers utilize solid, all-metal construction and the highest-grade Solingen steel blades. Advanced features such as transparent Lexan blade guards and automatic blade covers ensure the safety of the operator. All MBM Triumph Kutrimmer cutters have Solingen steel blades that may be removed and resharpened. Table size (D x W):15" x 12"
This Kutrimmer model is, I'd say, the minimum needed to cut the steel-backed KM73 polymer plates I use for photogravure. It does that adequately, and the safety guide is reassuring when smashing into a plate with my fingers less than an inch away holding the plate in position. But I only cut a small handful of plates most weeks. For anyone considering a substantially higher volume, I'd recommend going up a bit in the Kutrimmer line, although that can be painful pricewise. But this is a quality product that performs exactly as advertised. Welcome to MyBinding video. 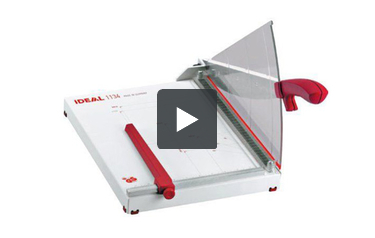 Let's take a look at MBM's Ideal 1134 Paper Trimmer. The Cut Trimmer 1134 is an all-metal, a very durable guillotine-style trimmer. It's built to last in your office for a long time. There are plenty of measuring tools right on the front in English and metric sizes and the blade itself is 13-3/4 inches long in its cut. The Soligen steel blade can be resharpened and a replacement kit is easily ordered and installed. The movable fence rides along this rail and clamps down for consistent trimming. The Ideal 1134 can handle up to 25 sheets of 20-pound paper in a single trim and does great with card stock, paper, photos, laminating materials and just about anything that you need to trim in your office. And for the custom job, there are plenty of angle measurements on the table as well to make exactly what you need happen. All in all, it's a great trimmer. That's the Cut Trimmer Ideal 1134 by MBM. For more demos, reviews and how-tos, check out mybinding.com. A guillotine paper cutter that can fit on a tabletop is a great addition to any workplace. One such device is the MBM Kutrimmer 1134. Here's a look at its strengths and weaknesses so you'll know if it's worth buying or not. The Kutrimmer 1134 can cut up to 25 sheets of paper at once. This cutting capacity is based on 20 lb. bond paper and is really terrific for a guillotine cutter. You'll be able to cut your paper quickly and easily so you can move on to the next phase of your project. This cutter can work with paper that's up to 13.75" long. This is perfect for letter- and legal-sized sheets, the two most commonly used sizes of paper. You can even use this device to trim photographs. To ensure your safety, this trimmer has a Lexan fan-shaped guard attached to it. (Lexan is a type of durable plastic.) The guard will keeps your hands free of the blade so you don't get injured. Plus, this feature is translucent so you'll still be able to keep an eye on your cutting. And the blade handle is ergonomically friendly so your hands won't get tired when using this device. The Kutrimmer 1134's blade is made out of Solingen steel, one of the best metals available. The blade isn't self-sharpening, but you can remove it so it may be sharpened by hand. If you need to measure your sheets before cutting, this trimmer has side guides you can use as rulers. Both metric and standard measurements are used for your convenience. There are also cutting guides that have the dimensions of various paper sizes. This would be a good tabletop trimmer because it only measures 22.5" (depth) x 13.25" (width) x 12" (height). And it weighs just 11 pounds so you can easily move it to another place if you need to. With its 13.75-inch cutting length, the Kutrimmer 1134 can't be use to trim large sheets of paper. If you think you'll need to work with larger items, you might want to consider something like the Kutrimmer 1058 which can trim sheets up to 22.5" long. This product's warranty could be improved. It offers only 1 year of coverage and it doesn't includes wearables. The Kutrimmer 1134's red and gray color scheme isn't the greatest. In fact, it kind of makes this device look like a toy instead of the high-quality cutter it actually is. The MBM Kutrimmer 1134 only has a few weaknesses, but it has a lot of strengths. This device offers a great cutting capacity, durable construction, and a safety guard so you don't get injured. It's large enough for letter- and legal-sized paper and it can easily fit on just about any surface. As for its weaknesses, a warranty is still a warranty and the cutting length should be good for most jobs. All together, the 1134 is a great guillotine cutter. Check it out today. Cutting Length 13 3/4" 13 3/4" 15" 18" 22 1/2" 28 1/2"
Table Size (D x W) 15 x 12" 15 x 12" 23 3/4" x 14" 20" x 14" 23 3/4" x 14" 30" x 20"
Dimensions (D x W x H) 22 1/4" x 13 1/4" x 12" 23" x 13 3/8" x 12 3/4" 31" x 16" x 10" 27 1/2" x 15 1/4" x 15" 31" x 16" x 10" 38 1/2" x 22 1/4" x 20 1/2"